Hey just wanted to say Thanks! for figuring that out and providing the firmware to help downgrade. I upgraded to US firmware 1.34NA and all I have experience was drops left and right on my wireless connections. I almost end up buying a new router until I saw your post and decided to give it a shot. I was able to get it back to the 1.33NA US release just fine and so far it seems to be working. I guess I will stay on these release until a better firmware gets release. Just to update others, I’ve had this firmware installed since I wrote this and I haven’t had any problems with my router, in fact it’s one of the most stable firmwares I’ve had for this router. I found your post this morning, I have had nothing but trouble with my DIR-655 and I’m at the point that I want to toss it. I’m going to try the firmware you have posted above however where can I obtain the official Australian Firmware 1.21. Can you zip it up and email it to me. 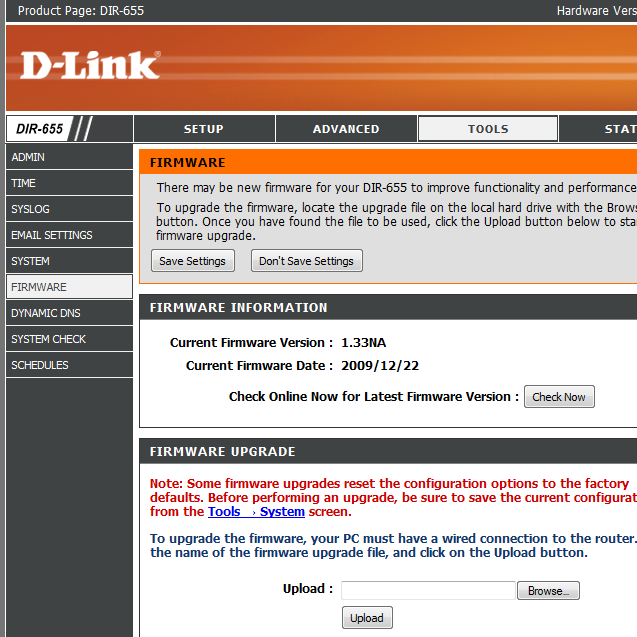 I’ve noticed that the AU D-Link page has removed the old versions so I had to dig around my PC for the old 1.21 version, I have uploaded the firmware here. Keep in mind it only works on A1 and A2 hardware versions of the router, this can be found at the top of the the router’s admin page if in doubt, it also doesn’t work on the new B revision of the router. That’s right, the EU & AU firmwares can be directly downgraded (supposedly because they use the same kernel as the older versions), however the US versions had a block on downgrading past the NA 1.30 version, the RU firmware somehow is allowed to be *upgraded* to from those and at that point you are on the original track of firmware and can install whatever firmware you want. WOW!!! Incredible. I had to hard wire my sons PS3 to the DIR-655 before as the wireless kept dropping and I was so close to purchasing a new router when I stumbled upon your post. I have 9 plus devices in the house using wireless and since I’ve downgraded to 1.21 the network has been 100% stable. No more complaints from the family! Awesome!! Tech support at D-Link should learn from this. Thanks for this. I was able to down grade one of my units back to 1.21 US version. If things stabilize i will be doing this to all my units. Thanks again. I have tried this method to downgrade from firmware version 1.35NA but it does not work. Any suggestions. Hi, I have bought a DIR-655. As a habit, i insist on upgrading to the latest version. BIGGEST MISTAKE. I am stuck on 1.33NA and I (somehow) am not able to downgrade. By this, i mean that when i told my router to upgrade to the russian firmware, it uploads it and shows the updating configuration page. But when the page reloads, its still on 1.33NA! No change whatsoever. Even the configuration stays the same. Now my question is, can i downgrade to the lowest possible firmware or should i go to 1.34NA, as it is supposed to have solved the rebooting problems? I am sorry its a long reply, but any help would be greatly appreciated! For future reference it’s important to note that if you have a new revision B version of this router then this won’t work anymore because they can’t run on anything lower than version 2 firmware. I haven’t personally tried downgrading from the final 1.33NA firmware, or the 1.35NA firmware, it’s possible that this method has been blocked now, however try it from different browsers as firmware updating sometimes has trouble with certain browsers, even though it seems to complete properly. As with the revision B models, later revision A models don’t work with certain firmware versions prior to the version they came with, if the russian firmware is lower than that (check the date, not the version as that has no direct version comparison between EU/US and AU firmwares) then it will probably reject that firmware, or at worst brick the router though I have never heard of that actually happening. Using a DIR-655 revision A4 firmware version 1.31EU (for European products) since a couple of years with numerous wireless dropouts most likely caused by interference. Tried the factory reset, installed the russian firmware 1.31RU then downgraded to 1.21EU. worked lika a charm. So far so good, will let the community know how it goes. Hopefully the dropouts are history. I have the A4 revision and I can downgrade 1.31ru > 1.21 but I cant downgrade 1.21 > 1.11…. Tried to reset but it dont work. Is there anyway to get the 1.11 firmware on A4? Im usinge 1.35EU at the moment that I find the most working, but I get 40/20 on my 100/10 connection when im using the wireless connection…. As far as I know only the A1 and A2 (and maybe the A3?) revisions can run on the 1.11 firmware. The A4 apparently first came with the 1.21 firmware and usually that means it has something in it that the A4 hardware needs to run, if you were to somehow get the 1.11 firmware on it, it would probably no longer work. ok the oldest fw I have managed to upload is 1.20. Is there any firmware that is working better than other with the A5? It really depends on your specific setup and how you’re using the router, however the pre-1.21 firmwares are considered to be quite stable on most hardware, with 1.21 seemingly the favoured version amongst other users as it has the most features of the stable versions. Just wanna ask if version 2.0 is possible to downgrade.. Im having a problem with this router since it always drops its internet connection. no connectivity both lan and wireless connection. it disconnects and the only way to have the internet back is to switch off both modem and router.. if this happens permanently and always to switch on/off the router and modem. this may lead to damage both in no times. i know that it is not advisable to always turn on/off the router. so, is there any way to downgrade this to a stable connection? havent tried to upgrade it coz maybe there will be more bugs on the latest firmware. Unfortunately no, the revision B is basically a different router altogether, it has different features and a completely different firmware, despite the numbering there was no firmware before version 2.00.